When someone we love dies, many of us are afraid that we will lose our special love connection with each other. As newly bereaved persons, we have no idea how we will keep that love flame burning to feel the closeness we want to save and treasure for eternity. Luckily, as time goes by, and creativity kicks in, we find some very beautiful and meaningful ways to remain solidly connected to our loved ones. When my two eldest children, twenty-one-year old Denis and nineteen-year-old Peggy, died in the same 1986 car accident, I, too, wondered how I was going to keep linked to these precious children, making sure they would never be erased from my heart and other’s people’s memories. In those early months of grief, their faces haunted my mind, whether it was in the wee hours of the morning, in the endless hours of the day, or in the restless hours of the night. I kept asking myself, “What will keep their memories from being erased for me, what will help me deal with this loss, what will make me feel alive again? As I started on this grief journey, I could not wear enough of Denis’ and Peggy’s things to feel their presence, their smell, their energy, and their spirit. I wrapped myself in their college sweatshirts, lifeguard gear, lacrosse uniforms, favorite tee shirts, snuggly bathrobes and cozy jackets. I wore their sports hats, wrist watches, bracelets, necklaces, and miraculous medals. I adorned myself with Peggy’s array of earrings and eagerly sported her big, colorful pocketbooks. I hugged their teddy bears and listened to their favorite records (no CDs then). I read and reread their letters and homemade cards and stacked them in a special box. I immersed myself in their familiar world so I would never forget all the things that contributed to forming their unique personalities. To this day, twenty-one years later, I still feel their presence in my life when I recall these moments or when I peek into my special Memory Box with the “high priority” things that I cannot part with, the things that I will probably take to the grave with me, keeping me linked to my children forever. Many of us have had special pieces of jewelry made with our loved one’s faces etched on them, designed on a variety of shapes that have meaning for us—heart, shamrock, football, silhouette. Necklaces and lockets seem to be the number one choice, but many have created handsome pins using a favorite picture to display. Sometimes we are gifted with one of these precious pieces of jewelry and find it does wonders for our heart. Both men and women proudly wear them sharing their loved one with the world. Some of us were absolutely delighted to discover a unique wristwatch on which a photo of our loved one could become the face of the watch. Imagine how many times a day we could happily check the time to see that loving face? Others take sports and academic medals and have them fashioned into handsome pendants for all to see and hopefully to spark conversation about their special person. Necklaces and bracelets elegantly spelling out the name of our loved one also have become popular to wear and usually invite inquiries giving us another opportunity to talk about this person. Anything that helps us keep talking and sharing all those memories is a positive step in our healing. And what a nice way to heal! 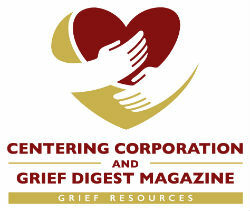 Since we all grieve differently, each of us has to explore and find which of these avenues works for us in our grief. Some bereaved folks are now welcoming tattoos as a special way to remember their loved ones. I have not succumbed to this new age fad, but who knows what the future will bring? Whole families have donned tattoos to show their everlasting love. I have seen moms and dads and even grandma march to the tattoo parlor so they could honor their child and grandchild by being tattooed with their name or symbol. One dad got a giant shamrock with angel wings imprinted on his arm in honor of his son. He said all the ladies love to kiss it when he shows it to them, which actually makes him smile, especially when he thinks of what his son would be saying after he had been forbidden to get a tattoo. That simple action lightens the burden in dad’s heart and makes him feel very close to his son. We find whatever will bring us some relief from the terrible pain of our loss, and if we can smile too, that’s even better. Surprisingly, many of us stumble into something that brings a measure of joy to our hearts as a connection with our loved one. It could be rainbows, hearts, butterflies, happy faces, frogs, unicorns, soccer balls, whatever makes us forget the pain for a few minutes and be able to focus on something that fills us with a good feeling. Mine was angels. A few months after my children died, I spotted a darling little felt angel in a local store that seemed to call out to me, “Take me home,” and that was the beginning of a twenty-one-year love affair with angels. They offered comfort to my aching heart. No matter where I went, I brought home an angel. Selecting them, buying them, carrying them home, inscribing my children’s names and dates on them, wrapping them and mailing them to special people kept me alive. I wanted everyone to remember my Denis and Peggy so I gave everyone one of these angels. Unplanned, this became a tradition and all my friends and relatives now have twenty-one angels on their Christmas trees or mantle—all tagged with Denis’ and Peggy’s names, never to be forgotten. My home is “Angel Heaven” because now all my friends gift me with angels from wherever they travel. What a collection I have! I had no idea what I had started, but it certainly brought joy into my life when I needed it. Others have filled their homes with butterflies, finding towels, curtains, tablecloths, guest towels, shower curtains, paintings, ceramics, dishes, platters, tea pots, paper weights, magnets—all filling their hearts with the comfort of butterflies. Whatever speaks to your heart is the way to go. Anything that keeps you busy and smiling at the same time is worth the pursuit. And sharing it with others brings another kind of joy because you know they will be remembering your loved one, too. If people think we are crazy, that’s all right because we bereaved are allowed to be crazy as long as we are not hurting anyone. We are simply keeping that link forever forged and what a grand feeling it is! So, look for those rainbows or frogs or whatever gives you a passion to keep your loved one remembered. In all these years, I have yet to meet a bereaved person who would not be delighted to receive a sign from their loved one who has died. Whether we feel they are dropping pennies from heaven, making the clock strike on a meaningful hour, having a flower bloom for a special occasion, putting someone who looks like them in our path, sending a message via a street sign, a calendar date, a song on the radio, or a passing license plate, we interpret these events as a message from them and it opens our hearts to being rejuvenated. I stay very much connected with my children by putting them in charge of the weather for all our big family events. Believe it or not, they have a fabulous track record for showers, weddings and birthday parties. Their reputation is so good that I get many requests for their help. It is a warm, fuzzy feeling including Peggy and Denis in these occasions, a happy sign that they are always with us. It makes my heart sing when people say, “Thank you, Peggy and Denis,” after requesting and getting good weather for their event. Now that’s a sign my children are always listening, definitely staying connected with me. One of my favorite “sign stories” is of the family who shared with their church some of the gorgeous bouquets of flowers they received when their son died. The mom sighed, “Robbie, just give me a sign that you are happy we are bringing these flowers over to the church.” As her daughters entered the side door of the church, the door was held open by a wooden wedge that had their brother’s initials, “R.E. P.,” carved on it and they rushed home to tell their mother what a fabulous sign they had gotten from their brother. That made the mom’s day to know her son approved. Months later the family found out that “R.E.P.” stood for “Religious Education Program” at the church, but you see, the sign was there when they needed to feel connected. When my latest book, The Death of a Child: Reflections for Grieving Parents, was about to roll off the press, my publisher e-mailed me telling me that he had just shipped the very first copy to me at my office address. I was thrilled to know the book was finally published and on its way, but I was so disappointed because my office had just closed for Christmas week, meaning I would have to wait a whole week before seeing the finished book “hot off the press.” At 4:30 pm on Christmas Eve, the doorbell rang and there was the UPS man delivering my book, which had the name of my office building on it but with my home address. I still haven’t figured out how Denis and Peggy guided that package to me for the best Christmas present I ever had, but down deep, I knew they were involved! Do keep looking as that yellow butterfly flits by, or the gorgeous rainbow appears, or you are pulled to something that has special meaning to you. Don’t miss a single sign that is sent so uniquely and lovingly to you. Enjoy all the love connections you have created. They will heal your heart and let happiness spring back into your life. They will lead you out of the valley and up to the mountain top, where you can sit and grin as you treasure each memory.